While Professor X is active, your opponent cannot reroll dice during the roll and reroll step. He or she can pay 2 life to prevent this effect for this turn. 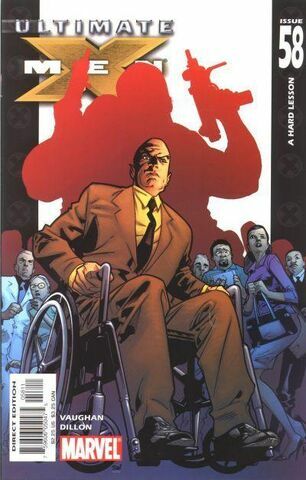 Professor X: Principal requires the opposing player to pay life to circumvent his effect. This 2 life is considered a cost and not the equivalent of taking damage. As a result, character effects that depend upon the opposing player taking damage would not trigger (e.g., Hulk: Green Goliath). When active, Scarlet Witch: Controls Probability allows any or all of dice to be rerolled one additional time during the roll and reroll step. If Professor X is active, a player cannot reroll until he or she pay life, but need only to pay once to ignore Professor X's effect and reroll once or, as allowed by an active Scarlet Witch, twice. ^ Ultimate X-Men Vol 2000 #58. Marvel.com. Retrieved 4 October 2016.